Welcome to the fourth Blogger’s Quilt Festival! I am so glad that you are here! I sincerely hope that you plan to enter a quilt and share in the festivities. Everyone is welcome, and encouraged to participate, no matter your skill level or number of quilts completed! There’s no judging in our festival, instead lots of new friends to be made and inspiration to be found! I must begin by thanking our sponsors! Thank you all!! They have been generous and great to work with in the weeks leading up to today. Please take time to visit each of the shops and find a little something special for yourself. While you hop through the list, let me know if you see a quilter you would like to have featured on my Friday, Festival Feature. I’m always in need of more Featured Quilters! Ready to share your quilt? In your post, link back to the festival. You can do this with a button, just copy and paste the code into your post, if all else fails. Share a permalink to your post, in the linky. Right click on your post title to copy link address, then paste it in the linky. Leave me a comment to be entered in the giveaways. Maybe you can tell me approximately how many yards of fabric you have in your stash. It’s fun to learn something (be entertained) as I read all the comments. If you are on flickr, consider adding your entry to the Group Pool, it’s great to see all the quilts in the gallery! 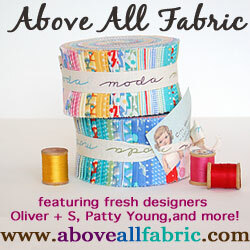 Above All Fabric is offering a set of Pure fat quarters! Canton Village Quilt Works is offering 2 $20 Gift Certificates! FabricWorm is offering a set of Modern Affair fat quarters! 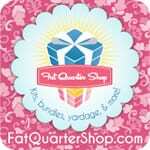 Fat Quarter Shop is offering 2 $50 Gift Certificates! Sewing on the Edge is offering 2 pin cushions! The Creative Connection is offering a SWAG bag from the recent Creative Connection event! Twiddletales is offering a Charm Pack and Layer Cake in Wee Woodland fabrics! Where Women Cook is offering a SWAG bag from the recent Creative Connection event! Wondrous Woven Fabrics is offering an Origins Charm Pack and 6 complimentary half yard cuts! 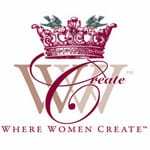 Where Women Create is offering a SWAG bag from the recent Creative Connection event! Angie’s Bit’s & Pieces is offering a One Year Membership, and access to hundreds of patterns! Back Porch Design is offering Crazy Curves Continues book and Crazy Curves 7″ Template! Cottage Garden Quilts is offering a $50 Gift Certificate! Fabric Shoppe is offering a 5 yard bundle of Meadowsweet 2, and a surprise pattern! Hip Fabric is offering a $20 Gift Certificate! I Have A Notion is offering a Aurifil Sparkle Thread Collection! Jillily Studio is offering a Thistledown fat quarter bundle, and a bottle of Appli-Glue! Pat Sloan is offering her Fast Forward Quilts book! Patchwork Trails is offering a beautiful Project Bag! Piece N Quilt is offering a pattern pack of five brand new patterns! Pink Chalk Fabrics is offering a $20 Gift Certificate! Sew Fresh Fabrics is offering your choice of 10 Designer Cotton fat quarters, or 10 Kona half yards. So Fun Fabrics is offering a $25 Gift Certificate! The Quilted Fish is offering a Sweet Divinity fat quarter bundle! Wish Upon a Quilt us offering 5 $10 Gift Certificates! After the Festival is over I will announce and contact winners! **Please do not link up if you are not posting a specific quilt, also linking to etsy/ebay shops is not allowed. I reserve the right to delete links that are not within the guidelines above. Enter your link and don’t forget to leave a comment! I hope you have a comfortable spot to enjoy the show from! If you have a question, please email me directly, as I will not be able to keep up with comments, and I will do my best to help. I can’t wait to wake up in the morning and start browsing the links! And great giveaways! Wahoo! I’ve been so excited for this!! I have no idea how many yards in my stash…far too many. I must admit though I have a lot of different fabrics in smaller amount, 1 yard or less. I only have a few things that are more than a yard. Thanks so much for this great festival! Woot! I’m so excited to share this quilt with everyone! What I LOVE about your festival Amy is the focus on the story behind the quilt! I had a great time thinking about what quilt to share, and I realized how important this quilt was to my artistic development! ANd I can’t wait to see all the others! Amy, we are super excited for fall quilt festival! My sis and I waited up late refreshing our computers! So fun, hope I win one of the many fun prizes! I probably have 20 yards in my stash…is that alot? Doesn’t seem like too much…I will have to check others comments. Thank you so much again, Amy, for hosting this festival. I am so looking forward to being inspired by all the quilts and stories we will have the privilege to see over the next few days and weeks. This is great fun! So excited about BQF!! How many yards of fabric do I have in my stash? I’m not sure that’s a quantifiable number! Maybe around 60 yards? I think a more telling question would be how many fat quarters I have: too many! Thanks for hosting BQF, Amy! You’re the best! Thanks for hosting what I am sure will be another wonderful Blogger’s Quilt Festival. I am looking forward to checking out many of the lovely quilts. My stash – I am not really a stasher – I tend to buy for specific projects. Thanks Amy for putting in all this hard work! I really enjoy meeting other people in this format! I am sharing an inspiration quilt that started all this business and my first quilt. I hope you can come and visit. Congrats again on your new book!! So excited about this BQF since I didn’t manage to be in the last one. Looking forward to seeing some gorgeous creations. Thanks Amy for hosting this great event. Yippie !!! The funtime is here again!! I just posted my entry, and I’m eager to spent some time looking at all those fabulous quilts around here. THANK YOU SO MUCH, Amy! I really appreciate all your work that goes with this. Have a great time! I’m so excited for BQF! Thanks for organizing and hosting :) I’m sure it’s a lot of work. Yardage in my stash … oh my … I bet if I added it all up, at least 100 yards, probably more. I have a problem. And I work at a fabric store so that doesn’t help! Cutting fabric for people all day only makes me want more. haha. Thanks for hosting this festival!! I love BQF! I barely completed my quilt in time before having to leave for Quilt Market. Between Market and viewing all the BQF entries, I think I’ll be on Quilty Over Stimulus Mode for awhile! Just finished my quilt post and am ready to go! I’m looking forward to seeing all the quilts. Thanks for hosting this event. Thank-you Amy for all your hard work – I’m going to spend most of the day here….. as for how much fabric – too much to confess to on a public forum….. I wish I had some idea of how yards of fabric are in my stash but I really have no idea. I know that most are less than 1/2 yard and some are really small. Thanks for hosting this! Thanks for doing this, Amy. I am excited to find more talented quilters out there! Thank you so much for organising such a wonderful event. I’ve entered my quilt and am looking forward to having a look at all of the other fabulous quilts on show. I just found your blog 2 days ago and am so glad I did. Thank you for putting this quilt festival together! I hope I’ve done all the steps right! I can’t wait to look through all these quilts. So far they are just yummy! This is so exciting. It is such a great idea, we are all appreciative to be a part of this. Can’t wait to read everyones posts. Wow! What great quilts in the show already – I’m so excited about seeing lots of great quilts here. Thanks for organising this, Amy – and thanks to the sponsors too – what a generous bunch you’ve found! Amy, Thanks so much for making the Blogger’s Quilt Festival possible again this season. I enjoy it so much! I know some people keep track of the yardage in their stash. I’m not sure I would want to know! I have mostly fat quarters, but let’s just say that I have enough fabric to quilt well into retirement and that won’t be for many years! Besides, I am always adding to my stash! I’m already browsing the beautiful quilts. How exciting to hear the stories that go with the quilts. Thannks for doing thus Amy! No, I haven’t the slightest clue, but I guess it could be 50-100 yards. At least I know I could make more than 1 quilt out of it. I am excited to be joining in this time! I have far too much fabric! But lots of ideas- just not enough time to make them all!! Thanks for hosting! yay, ´tis the season again!! 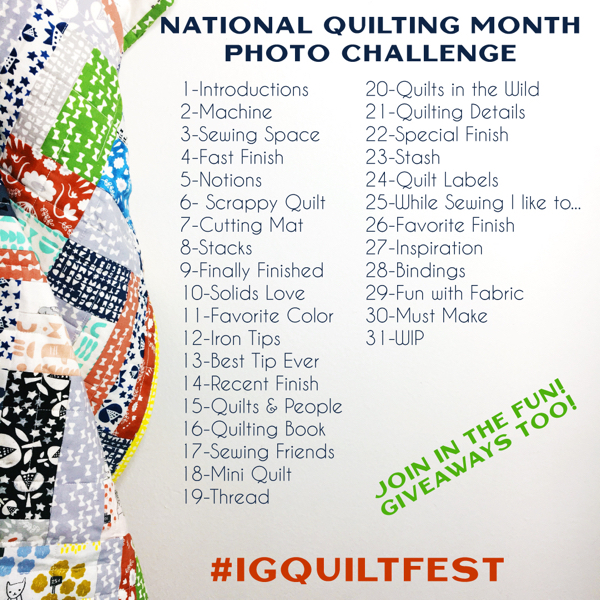 so happy to participate and can´t wait to check out all those lovely quilts out there!! Hi Amy! I have added my link and tried to calculate how many yards of fabric that’s in my stash. I gave up around a mile and a half. I would say I have a lot despite my efforts to use only from stash and not keep adding to it. Thanks for setting up the Blogger’s Quilt Festival again! YAY! It’s here! Amy, I look so forward to this, I’ve met so many amazing quilters through you – thank you so much for doing this! Stash? Not much of a stash anymore….sigh. I’m working on it though! I scared to even say how much Fabric I have in my Stash! Let’s Say If I never bought any more Fabric I could sew non-stop for about a Year…..Yikes! Excellent work, Amy! When I last counted (well, weighed) I had almost 1.4km of fabric in my stash; now it would be about 1.5km (almost a mile)! Hi, Amy! Thanks for hosting this fun Quilt Festival! And congrats on the new book! Now, don’t let my husband read this, but I have a stash of fabric in a bookcase full of shoebox size bins, a stash of assorted batting on rolls that I store in the tub, a stash of upholstery fabrics in nine or ten large bins and garbage bags on shelves in the garage, a stash of 19 unquilted quilt tops of my own in a bin under my longarm machine, plus a stash of clients’ quilts on hangers in my closet that will take me through Christmas and beyone, a stash of buttons in jars on my cutting table, a stash of 80 cones of thread on a shelf, and a stash of 59 UFOs on shelves and in the window seat. I also have a stash of quilted table runners in a bin in the kitchen and a stash of quilts that fill the linen closet to the brim… yup, I am a quilter. These Bloggers’ Quilt Festivals are such a wonderful idea — it is so great to see all the beautiful quilts and meet bloggers that one perhaps would not have come across were it not for the Festival! Thanks for all the work you put into this. It is really appreciated! How much yardage in my stash? I haven’t a clue as I’m mostly a scrap quilter and tend to buy FQs and half yards. Is it that time of year already? Thanks for hosting this Blogger’s Quilt festival again. I can’t wait to look at all the lovely blogs and be inspired. Yahoo! Just got my quilt posted and I cant wait to start looking at all the posts! Thanks Amy for putting this together! Thank you for hosting this lovely virtual quilt show!!!! I’m really pleased to be able to participate in all the festivals so far. What a wonderful idea this was. Thank you so much for all you do for us blogging quilters. Yikes, I totally forgot to add that I have no idea how many yards of fabric are in my stash. Really. No idea. How many yards in my stash? That is top secret information – you never know what my husband might be reading. Let’s just say more than I can count on my fingers and toes. Thanks for another amazing festival – I can’t wait to start visiting all these gorgeous quilts! Thanks again Amy for hosting this – its greatly appreciated!!! I literally have thousands and thousands of yds in my stash. Last summer I did a huge stash sell-off – sold off about 1/5th of my collection which was over 1000 yds – I sold it for only 2 bucks a yd and earned enough to go to Quilt conference next year for a week! My quilt friends are happy for a bargain – I’m happy to go to Quilting by the Lake and my stash is so much easier to navigate now! I’m headed camping tomorrow with a group of Sparks and Brownies (Girl Guides), so I won’t be posting until Monday… Thanks for hosting this. As for how many yards of fabric… now that is a nasty question. Do I need to answer by fabric type. Quilting cottons – I have less than 100m! But that doesn’t really highlight my stash that includes fleece, denim, home dec, knits, outerwear, and much more! I probably have more than 1000m, but it is decreasing! YEAH!!!! I love to see everyone’s quilts, is anyone as obsessed as a quilter, lol! I don’t know how much fabric I have in my stash, I’m not sure I want to know — and I make a conscious effort not to add to it. And STILL I could make at least a dozen quilts and not buy fabric but backing materials. Busy making a monster queen sized quilt with a whole lotta flying geese this week. Have 178 geese units to make for one of my borders, diving into that this weekend. There is a central blocks unit (done), pieced border (done and sewn on), 2 narrow plain borders (cut, sewing those on today), a pieced border (the 178 flying geese, cut, to be pieced) and a final border (cut). Thanks you so much Amy for undertaking such an enormous task. It is so appreciated. There is going to be some serious commenting going on in these parts. Thanks, Amy, for organising such a wonderful festival. This is the first time I have had the opportunity to participate and I am so excited. In the past it has taken me weeks and weeks to go through the quilts in the festival and look at all the blogs for each one. I have found so much inspiration along the way. I am looking forward to discovering more new sites and enjoying all the great work on display. Wow, Amy! Looks like the BQF is off to a humming start already–so many colorful links! Thank you for the time to take to organise this. I’m sure I’m not the only quilter who gets a lot of pleasure from seeing the quilts. What a wonderful way to connect with other quilters. I live in Ireland and I am so inspired by all of the wonderful quilters out there in cyberspace. I just wish I lived in the USA so I could could see some of your work and share your quilt shows, classes and festivals. Thanks for allowing me a lone quilter in Ireland to share in this festival! Thanks my for once again hosting this great event for everyone. 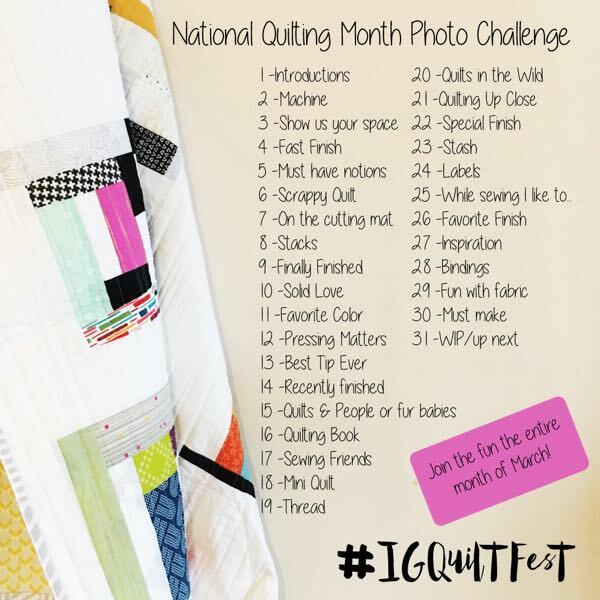 Can’t wait to get inspired by all the lovely quilty photos out there. I have no idea how many yards of fabric I have in my stash and actually don’t really want to know..that would be scary! But you can never have enough right? Thank you for hosting another Quilt Festival. It is great to see thumbnail pictures! Can´t wait to check out all those lovely quilts out there!! Thanks for doing this again! There is way too much fabric in my stash to count the yards! It’s one of the most wonderful days of the year! The Bloggers Quilt Festival!! Thank you Amy for organizing this inspiring show of creativity and talent!! It is because of the festival that I started blogging a year ago!! It has changed my life, and I have “met” so many amazing quilters that are now friends! This is going to be a fun week of beautiful quilts and getting to know new people. Thanks for organising such a great festival for quilty bloggers!! Oh, I’m so excited about this quilt festival! Such a wonderful idea. I’m a new quilter and participating for the first time. So fun to see all these great quilts. btw – I have no idea how much is in my stash already, but probably about 50 yrds or so? I’m looking forward to seeing all the quilts. Thank you for undertaking such a big task. As far as my stash, I don’t exactly know how much I have. I don’t think I’d win the “she who has the most fabric” contest, but I have enough to keep me busy for a very long time. Wow, there are so many awesome giveaways! This is such an awesome thing to host, Amy, I’m really excited to go see what everyone has to show for the festival. Thank you so much for hosting this!! As for something about me, I haven’t a clue how much fabric is in my stash, but I’d guess it’s in excess of 150 yds or so. Eek! Don’t tell my husband! I love the thumbnails, Amy! Thanks for hosting this again…can’t wait to see all the quilts. I don’t even want to try to count the yards in my stash…my husband might be stalking my comments!! I posted an entry about my first foray into math quilts: http://domesticat.net/2010/10/intro-penmanship-bloggers-quilt-festival-2010 To my knowledge, it’s the first Penrose cartwheel quilt in existence. Thanks for hosting! This is going to be fun to tour all the quilts! I’m so happy I could add into the blogger’s quilt festival. I’m driving out to market today, but I wanted to add my link… so at 5 something A.M. I’m here, & I’m in. I hope I win! I am super excited to be part of the festival this year! You do such a spectacular job of organizing this – last year was so inspiring :) hmmm… yards of fabric, now that is a scary question [luckily I don’t think my husband will be reading this] – probably at least a couple hundred yards. Yikes! Hurray! It’s started, it’s started! Thanks for all your hard work, Amy! This is my first BQF…thanks for setting it up. Stash??? More yards than I will use in 2 lifetimes, and more expected. As a guess, easily 300! Hi Amy, Thanks for all your work! I enjoyed making my quilt so much because it was going to a blogging friend I’d never met before last week. I’m so glad the quilt festival was scheduled after I finished it! By the way, I have no clue on yards in stash…probably under 25. Amy, this is one of my favorite blog events! Thanks so very much for all of your hardwork and organization to make this event happen. It will be wonderful meeting all these quilts this next week. Again, THANK YOU! Thank you so much for the thumbnail options- it looks really cool! Amy-Thank you for hosting this fun event again. I can’t wait to go and visit everyone’s quilts. What a great weekend this will be to get inspired and drool over everyone’s hard work. One never tired of looking at all the color and design created with quilting. OK, I’m a dork. I put the wrong link on one of my links so I re-posted it. Sorry, forgive me? If you want you can delete the link that goes to the blog url and not the post url… (I blame it on lack of coffee…LOL). Thanks to you and your sponsors for allowing us some brag (and learning) space! I can’t wait to see to everyone’s quilts and get lotsa inspirations and ideas… plus the courage to try a new technique or two! Amy this is my first time enter your festival! I have at least a thousand yards of fabric in my stash. I have been quilting for a long time! Thanks for hosting such a fun party — I look forward to it for weeks! I have just posted my antique schoolhouse quilt. Hope you enjoy it. Can’t even imagine how many yards I have, a gazillion may be close. Thanks. Hope to see you at the HMQS this spring. I’ve posted my miniature pink and white quilt for the festival, this quilt actual has been to Houston for that other festival. Again I’m guessing I have about a gazillion yards of fabric. Whew Amy – thanks for doing this again! How many yards of fabric in my stash? = way too many!!! I’ll have to get back to you on that after I spend a day locating it throughout the house and measuring it! Cool! I love the new link tool which shows a thumbnail of everyone’s quilts! This is going to be so fun to check out all the beautiful work out there. I love being able to connect with so many other quilters from all over this great world. Thanks Amy! This is a wonderful event. I so enjoy discovering more quilt bloggers. This is my second time in the festival! Looking forward to seeing all the quilts! I have a small stash as I TRY to only buy when I need fabric for a project. So excited to see all the gorgeous quilts again! Thanks for hosting the festival, Amy! Thank you, Amy, for hosting this festival again. It is so much fun. How much yardage in my stash? LOL. I have NO clue. First time I have seen or been in the festival- what a generous thing to host and a great way to find out more about different bloggers. I thought my stash was small but when I think about yardage I start to worry- I can’t fess up, but I have plans for it all! I haven’t a clue how many yards I have. Most of my stash is in fat quarters but I’ve been buying some yardage when I spot a bargain. Of course I then end up stuffing it in different places all over the house and forget what I’ve got! I’m planning a play with stash weekend so who knows what delights I’ll find! This is new to me. I’m looking forward to begin inspired by others. Thanks for sponsoring this. Great idea. Amy’s thanks for organizing this quilt festival!! I can’t wait look at all the quilts and read the stories. As for my stash, I am afraid to inventory too much but I have been using it up this last year. Makes room for newer stash. Just linked my post! Thanks so much for hosting this again. I have to admit, I am scared to try to figure out how many yards are in my stash. I’ve been stash-building for 17 years. Do fabrics in kits count? Oh my, I don’t think I want to know. I don’t want to know how much fabric I added to my stash just this year – LOL! Thanks for doing this again – it is so much fun. I have a closet full of stash fabric, at least 1,000 yards. Shh! Don’t tell my husband! What he doesn’t know won’t bother him. I have added my link and am so excited to participate in this Quilt Festival. Thanks so much for organizing and hosting it. Such fun! I am enjoying all the quilts. I don’t blog so no link for me but I do enjoy all the inspiration here Amy! Thank you AMY! You are such a doll. We’re all so lucky to have you blogging with us! Thanks for inspiring & supporting us! When my alarm went off this morning, I rolled over to hit the snooze as usual. But then I remembered it’s Blogger’s Quilt Festival day! Gotta get up! How many yards to I have in my stash? Hmm. Probably not as many as most people. Maybe 20? Or perhaps I’m delusional. Thanks so much for hosting such a wonderful meet-up of bloggers! I my stash… oh dear. Well, if you count the 17 wal-mart bags full of scraps that my mom dropped off last week….. just kidding. There were only 8. Yes, ahem, counting that I would guess that I have between 50 and 75 yards in my stash. And very good intentions of using all of them! WOW !! Look at all of these already ! What a great response ALREADY !!! Will need to find MORE time for the computer checking these all out and I’m supposed to be sewing a Christmas gift !!!! Great job already Amy ! Thanks for a great Festival. I have no idea (nor do I want to) of how much I have in my stash. I am in a pleasant state of denial thank you very much! Look at all of these amazing quilts…I know how I am spending my rainy weekend…food in the crockpot and me sitting in front of my computer…teh family can fend for themselves while I go to a festival! LOL My stash – I have no clue how many yards are in it, there are so many scraps, fat quarters, scraps, yardage, scraps. I really have no idea how much yardage is there. Thanks for hosting the festival again! Love it! Thanks for hosting this festival!I have added my link and am so excited to participate in this Quilt Festival. How much yardage do I have? No idea. Less than 100 I think, (about half is clothing fabric) but I just ordered some discontinued Snippets and Wee Play so I think my yardage is getting back up there. :) When is too much really too much? Hi Amy, Thanks for hosting this fun event!! I shared a quilt I made for my sister :) Re: how many yards of fabric I have in my stash…OMG, I have no idea…but it is A LOT! Wow, I’ll have to throw out a guess on the yardage I have…I’d say it’s probably about 15? Thank you for organizing; I can’t wait to sit and read about all these wonderful quilts! Hi Amy, I have tried and tried, but am not able to link my post to the linky. I know you have a lot going on today, but just wondered what I might be doing wrong. Thanks for another great Quilt Festival. Just added my sister’s quilt to the festival. Thanks so much for putting this together again! It looks like we will be looking through quilts for a long time! :) As to my stash… I have no idea how much yardage I have. I’ve got a bunch of fat quarter sets, panels, jelly rolls, half yards, and big yardage for quilt backs in my stash, along with almost a full bolt of white. I never really keep track of how many yards I have, so its hard for me to estimate. I’m sure its up there! Thanks so much for doing this! I can’t wait to see all the beautiful quilts! My stash is slowly dwindling. I’ve been actively making it go away by making quilts for each of my niece & nephews (4 down, 7 to go). I’ve also gotten great joy in shipping off pieces that I love, but have grown tired of through blog give aways. What I really need to work on, is the 3 bins of fabric I bought to sew clothes. What was I thinking? I’m a terrible tailor. Thanks for this fun opportunity to enter a quilt show! Can’t wait to sit down when my little guy naps and enjoy all the quilts…just from the thumbnails, they all look amazing! Not sure how much fabric I have, but I have 3 of the same sewing machine, Elna Supermatic*s from 1964, making them more than twice my age (I’m 22). I’ve looked into modern machines, but I cant find one with more features and a longer arm until I get into the $1000+ range, and I’d rather spend that on more fabric. Thanks for hosting again. I just published my post, and I can’t wait to check out all these other amazing quilts. I love the linky pictures. It’s so cool to get a little preview of all the quilts. Another great online quilt show….another week of killing time on the computer reading all the posts! Amy, I have no idea how many yards of fabric are in my stash, I sort of hate to figure it up, too scary! What a wonderful way to wake up this morning! Thank you so much for organizing this Amy! I have no idea how many yards I have, but I’ll be realistic and say it’s probably close to 100. I have enjoyed looking at many of the bloggers’ entries already and am looking forward to seeing more. The quilts are so inspiring. They have given me some good ideas to add to my “to do” list. I probably have 200 yards of fabric. Recently went to a whole bolt sale. Luckily they will be used up for some backings. Thanks for doing the festival again. I am off to look at quilts now! This is such a great idea, this is my first year and am loving looking at all the fantastic quilts and reading the stories! And not to mention the prizes!! Thanks so much Amy, for getting my link to work :-) Now to sit back and enjoy the Quilt Festival. I just started quilting so I only have about 5 yards in my stash. Thanks for hosting the giveaway and all the wonderful inspiration! Thank you so much for having the show for us. I was feeling a little sad I couldn’t go to Houston this year to see all the wonderful quilts and being in your show brighten my week up for sure! This is my third quilt festival and I love taking part so much, and look forward to this bonanza of amazing quilts and blogs. Thanks so much for hosting this again Amy! I don’t want to know how many yards are there! It’s about 35 years of accumulating and I save all scraps bigger than 1 1/2 ” square. But I’d love to have more so enter me in your giveaway! I almost forgot to add my link and comment!! I love the format for the links this time…the pictures are great. It’s so much easier for me to remember a picture rather than a name! Thanks Amy! Hi, Amy! I’m so happy to be posting on the Bloggers Quilt Festival again! And I have no idea how many yards of fabric are in my stash – I think I’d be afraid to find out! But probably half of my stash was donated this year for our quilt ministry by lots of my fabulous quilt blog friends – so here’s a shout out to them!! I can’t wait to check out the quilts in this year’s festival!! Love, love, love the thumbnail links for the quilts! This is my first time entering, and I think it’s a fabulous idea. Thanks so much for hosting it. I really have no idea how many yards are in my stash, but if I had to guess it’s probably 100-150 which is a very scary thought to me. I really need to stop buying fabric and start sewing from my stash exclusively. There are just too many cute designs out there. I can’t stop myself! I am not sure I have done this all correctly but have a blog entry posted for the Blogger’s Quilt Festival now. You asked the question “How many yard in your stash?” That is a hard one to answer but I can tell you I have lots and most of it is fat quarters. I do a lot of miniatures so fat quarters go a long way. Gee I’m having trouble getting my comment posted…this may be a duplicate. I like the clickable photos…much easier to remember than names…for me!! just put my link and picture on the festival…this time i’m not number six hundred something!! i do not know how to put your linky or blinkie or whatever it’s called on my site, but i did put a link to here on there. if someone can tell me how to do it on blogspot, i’d appreciate it. copying it doesn’t seem to work but i could be doing it wrong…am probably doing it wrong!! i don’t know what a permalink is, so need to know what that is too. last time my daughter put the blinkie/linky/button on my site for me. i will try to get the picture on flickr also. just love this festival…such inspiration and i’ve tried things and colors i never would have tried because of what all the wonderful quilters did last year!! thanks so much amy for doing this!!!!!!!!! Thanks for sponsoring the quilt festival. This is my first time. Will definitely enjoy all o the creativity I will see here. Thanks for the fun quilt festival!! I can’t wait to check out all the entries. Hmmm how much fabric do I have in my stash? Not much actually! I really do try my best to buy what I need and use it up, my stash is mostly scraps. I guess if I had to put a number on it, I’d say *maybe* 30 yards of fabric total. but most of that is scraps. This is great fun Amy… wonderful idea. Number of yards.. I’d guess more than 200 but less than 350. Oh my that’s a lot!! I can’t believe I only just found this – it’s so inspiring. Thanks! This is awesome. I am fairly new to quilting but every time I go to a new shop I buy a kit and probably have 15 quilts waiting to be started plus 50 yards of stash. I always buy at least three yards when I like a fabric. The show has just started and there are so many wonderful quilts already displayed. I like your new linky tool, even though I had problems and wasn’t able to upload an image (I’m hoping you can help me out and I’ve sent you an email). Great, great prizes too. Thanks to all the sponsors and to Amy for this fun show! Hmm… how many yards of fabric do I have in my stash? Well, I just started collecting at the end of September, and I’d say I have about 15 yards of fabric. That’s just a guess. Thank you for hosting this event. I look forward to the next 7 days of being inspired. This is AWESOME!!! LOL! I love the new format with the linkies! Amazing eye candy!! Better get to work so I finish my entry by next Friday. Look at the turnout already!! My favorite thing…thanks for hosting, Amy! Oh boy, I wouldn’t even be able to attempt guessing how many yards of fabric I have….. If we were to count 4″ I-Spy squares (my current obsession! ), I would guess it’s in the thousands. Probably the 3,000’s. Yikes! Thanks for hosting the festival! It’s always so fun to see what other quilters are creating! Thank you for organizing this festival. It is my first time joining in. I can’t wait to look at all the other gorgeous quilts and be inspired. Thanks Amy for hosting another Blogger’s Quilt Festival. I’m going to have to enjoy most of it after making a 1200 mile move–tomorrow the computer’s are going to be packed up. It will give me something to look forward to. As for the amount of fabric I have, I don’t know. However, I can tell you that fabric makes good packing material for things like dishes and other breakable items. Thanks for the chance to appreciate what a crazy life I truly live and how amazing it is that I get as much done as I do. I posted my quilt My Life: Crazy Strings A Minute to remind all of us that we are capable of far more than even we ever dreamed possible! I must have a bazillion yards in stash. Two dressers full, two huge tubs full, 6 more drawers in various locations, and a bookcase full. Hi, my name’s Debbie and I’m a fabric addict. I have made two queen size scrappy quilts – 50 fabrics each – and I didn’t use the same fabric twice on either quilt. For instance. Amy, this is always a special time for us all. Thanks for taking your time to put together this wonderful blog hop! I’m off to do some hoppin myself! Thank you Amy for doing thsi once again! I do look forward to it. How much stash do I have? No idea, it’s scary to contemplate! Perhaps 100 yards? Not as much as some,but a lot for a small space! Can’t wait to look at all the quilts! Thanks Amy for hosting this great event once again :^) Poste.d on my blog and put up the link. I look forward to your hosting this fun week! Thanks for all the work that you do to get it going! How many yards of fabric ~ I would guess around 20 of cottons, but I’m not sure if any of that is a full yard, and probably 20 more yards of knits, fleece, and any poly-mixes. I also have a lot of scraps, some cut up into charms and smaller squares, and a couple boxes of a “mess” of scraps. Thanks for the chance at these great prizes! Wow oh Wow! look at all the beautiful entries! Amy, another great festival that will keep me glued to my computer for days reading all the great stories!! I have no idea how many yards of stash fabric I have, it seems to multiply each and every day! Hi Amy, thanks for hosting the Bloggers’ Quilt Festival. I have lots of fabric, but not all of its very pretty! Most of it was donated to me by “older” ladies who no longer want to or can sew. When making a quilt I can pull some fabric from my stash, but not usually without supplementing it at the fabric store. I do try to use as much of the stash as I can. Who knows, some day I may use it all. I’m sure I could sew for the rest of my days and not run out! Thank you Amy for having this wonderful quilt show again. And having the thumbnails of the quilts is a great idea. How many yards in my stash, oh dear, I would hate to have that get out!! It is way more than I like and I am sure that in the rest of my life I will not be able to get rid of it. One probably is that it just keeps reproducing, honestly. I shut the door and the next time I go in there it has increased. Just how does that happen!!?? Hi Amy, thanks for hosting the Bloggers’ quilt festival. I enjoy it alot. WOW!! There are so many beautiful quilts! I can’t wait to explore the sites and see the stories! I’ll have mine up by the end of the day. Thanks so much for doing this. I am posting my quilt today. I like being able to see a photo of the quilt that is entered in the festival. I’m having trouble uploading my own, but I know that it will work eventually. Please enter me in your giveaways……I’m whittling down an old collection of fabrics, 2 chests of drawers full, and really would like to win some fresh new fabrics. The quilts shown just get better and better each year – thank you for hosting it once again. I am going to enjoy looking at the quilts for weeks to come. Yards of fabric?! Yikes! That’s like looking in the mirror too closely. I bet that there are easily 100 yards of fabric…but that could be an underestimate. More fabric comes in than goes out unfortunately. I wish I could work with all it the way that I want to! WhoooHooo! I am so excited to be a part of your BQF!! Let the festivities begin :o). Thank you Amy putting this festival together. Always great to “meet” new-to-me bloggers. Now I will never get anything done. LOL. Thanks for having this wonderful Blogger Quilt Festival! So much fun to enter and to see everyone’s quilts. Yay! This is so much fun! Luckily I finally uploaded and posted my quilt so I could join in! Oooh, I love this festival. I have 40 gazillion yards of fun fabric in my stash. On to the loveliness! Amy, I love the thumbnails of the quilts on your blog for this festival!There are some great quilts! thanks as always for hosting! Yay! Finally done my blog post for the quilt festival! My personal fabric stash is quite small. Maybe 5-6 yards total? I seem to be having some trouble on the first try posting… argh. Second time is a charm, I hope! Thanks for hosting the festival Amy! I love seeing the thumbnails of the quilts right on your blog! They are all so wonderful! Thank you, Amy for having this Blogger Quilt Festival. It is my first time to enter in this festival and I have been very excited about it! As far as my stash goes, I have tons and tons…..literally! I have been sewing all my life and I’m sure I have fabric in my stash from the 70’s! Everytime I pull out a piece from the “old days”, it still reminds me of a memory. Isn’t that what quilts and quilting is all about….preserving memories? Amy – the photos are fabulous! What a great feature for the festival. Yards of fabric? I dare not count, although I do have it all in one place and visible so I’m not buying what I already have! Now I’m off to admire all the beautiful quilts and talented quilters! I’ve been looking forward to this. Can’t stop, places to go, quilts to see …..
A big THANK YOU to all the sponsors! Wish I was in Houston again for the show. As far as my stash….well, I have a bedroom with shelves & racks , like quilt shop, filled with bolts & bins of fat qtrs. This is 25+ years of collecting fabric, so, I have no idea exactly how many yards I have. But, as all quilter’s know…one can NEVER have too much fabric! Thank you so much again, Amy, for hosting this wonderful festival again! see all the photos together is just fantastic!!! Amy, thanks for posting this festival again. I’ve entered every time and love reading all the entries. Lets see,i have maybe about 75 yds, but that includes fat quarters, jelly rolls, and yardage and scraps. So excited to see so many gorgeous quilts. I love the new feature that has the thumbnails of the quilts. That way I’ll be able to go back to a quilt I especially like quickly. Thank you Amy for providing this opportunity of eye candy and to meet so many online quilters. I don’t have a ton of scraps because I have only ever sewn together 3/4 of one quilt top and I have had to go get more fabric. :) I started it 5 years ago and am getting very motivated to finish it. (it was a very ambitious one to start with. )I love the look of quilts and now that my babies are a little older I feel that I can try and learn again. Would love to win something to help with that! Thanks for another fun blogger’s quilt festival. It is fun to see all the quilts as little thumbnails. Thank you for hosting the BQF! I look forward to seeing all the wonderful quilts! I have a very small stash. I only buy fabric with a project in mind, so my stash is all small scraps. Once again ….. thank you …. for putting this festival together. There are so many lovely quilts to look at and new friends to meet. Love the idea of the thumbnails! This time around, I chose a jacket to enter. WOW! Lots and lots of great quilts this year! I couldn’t pick just one, but because I’m new at this I posted all of my quilts thus far! As for how much yardage I have? I have never counted, maybe I should! Another great job Amy, thanks a bunch!!! Amy – I’m LOVING the picture linky. So fun to get a birds-eye view of everything. Thanks!! Thanks! Can’t wait to be inspired by all the talented quilters out there! I have no idea how much fabric I have, but it makes me happy to look at it all stacked up and colorful!! I can’t believe the talent everyone has. Quilters are just the best! Thank you so much for organizing this. I’m loving every minute of it. So excited to be a part of this quilt fest! :) I’ve got maybe 15-20 yds of fabric in my stash… not too much I think. :) Now to get looking at all these beauties!!! Yay! I’m so excited to enter again!! I made a quilt inspired by the last bqf!! :) I don’t have a stash right now :( but I have fabric to make three quilts for Christmas. After I get through these I want to focus on Reagan’s quilt for her bed. It will be my first “full size” quilt so I’m a little intimidated to do free motion. But I will do it! :D Thanks for all the work you do!! p.s…I tried to copy and paste the code and it pasted the button IN a code box so I just copy and pasted your jpg. Hope that’s ok. I love seeing these with the thumbnail images – great idea! 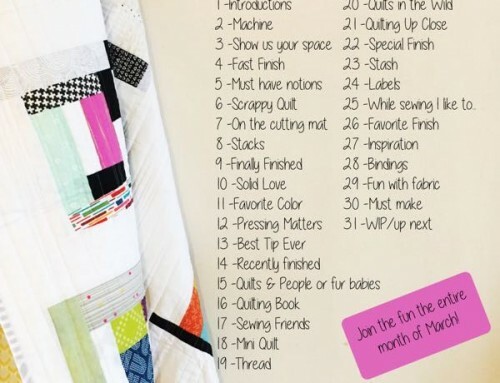 I can’t wait to visit these blog posts – I love Blogger’s Quilt Festival! Thank you so much for organizing! Not sure how many yards I have, but my stash is tiny! Just three small plastic bins. Thanks for hothe festival again. I didn’t read the instructions before I commented earlier. I don’t have yards of fabric in my stash. I just have bags of scraps! I enjoy scrap quilts and paper piecing small quilts. I have one storage tub of gallon zipper bags of scraps divided by color. When I make larger quilts I buy just the fabric needed for that project. I’ve had a chance to look at some of the blogs in the festival. This is great fun! Thanks for hosting this again. This is my first quilt festival – love it! My stash is VERY small…maybe 10 yards! And I have plans for all of it! Visiting all the lovely entries: to be done! Thanks Amy for organising yet another succesfull Festival, judging by the number of entries on the first day. And thanks to all the sponsors for their generous giveaways! I honestly don’t have a clue how many yards of fabric I have in my stash and that’s probably better because it would be a scary number! so much fun looking at all the beautiful quilts!!!! thank you! Thanks Amy for doing the quilt festivals! I really look forward to them! I wish you hadn’t made me consider how many yard of fabric I have. It makes me nervous… I’m more of an ignore the situation type of fabric hoarder. I love looking through all the beautiful quilts….thank you! thank you! about me….hum??? I have been quilting for 15+ years…can’t get enough of it!! How lucky am i?? What a neat idea. I love this Quilt Festival and hope to check out each site. Thanks for your work. thanks so much for putting this together again. I love it! and soo great to have a picture of each quilt on the link. sooo much easier to browse, and get inspired. thank you thank you thank you. This is such a wonderful way to share our quilts and enjoy seeing what others are making. I love the inspiration and beauty of so many quilts at one place. Thank you so much. 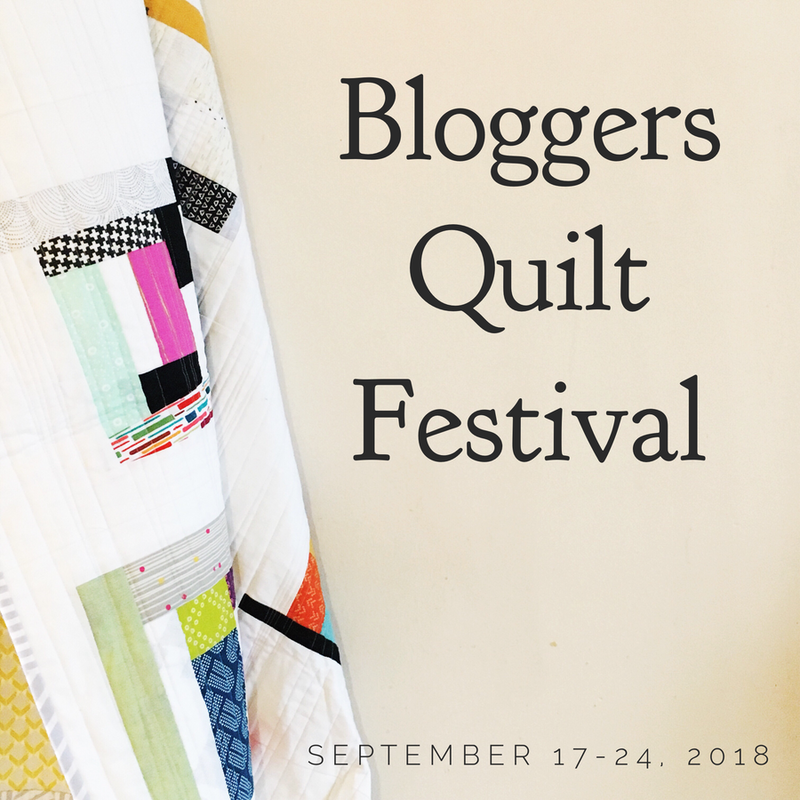 This is my first year as part of the Blogger’s Quilt Festival, I’m very excited to find some time to sit back and read many of the other posts submitted. As for my fabric stash size, gosh. All of my FQs are in a 3 drawn plastic rolling cabinet. The pieces which are bigger then a FQ up to several yards are in a 4 drawer filing cabinet. My scraps are in a small bin; which seriously needs some upgrading. Thanks for putting this all together (again) love the picture links those are really great. As for my fabric stash I don’t have enough and that’s all I’m going to say. Thank you Amy, for hosting this wonderful “Quilt Show” that we can enjoy from our own homes. You have done a wonderful job. And thanks too for all the sponsors in making it possible. I’ve entered one of my quilts. It’s my first time joining in on the fun, I was a spectator last round. This is a blast thank you! I don’t count the yards, I just see what ?I have and use it to create, hehehe. Thanks for hosting this great festival. Oops!! I just added this comment to the wrong post. My bad! My stash just keeps on growing and growing. Like the giant plant in Little Shop of Horrors — “feed me Seymour!”. What can I say, I have Halloween on my mind. I just keep on feeding it and well I desperately need to get my fantasy quilts out of my head and into quilts. I LOVE the new linking with the little pictures. Thanks for hosting again! Thx for hosting this fun event. I’m so excited to take part for the first time. Everyone’s work looks AMAZING! I was SO excited to log on this morning and start enjoying some quilty goodness. Thanks for hosting this awesome party, Amy. I love the new linky with the thumbnails! Thanks Amy! I can’t wait to look at all the quilts! I have no idea how many yards of fabric I have in my stash. Plenty! But, really, my stash is not that big compared to some! Thanks for organizing another great quilt festival, Amy! I love seeing thumbnails of the entries – very inspiring and delicious eye candy. Thanks for putting this together. I’m ready to start looking at all the quilts. This is my first time participating, and so it’s all very exciting. Thank you for organizing again, Amy. The new linky is fab! I love it for being able to find to favorites again later. I added my blog post and quilt to the Festival lineup. Thank you for all the work you do to put the Festival together. It is fun to see the other quilts and read about them. Thanks Amy! I am new to blogging…so hope I completed the task at hand correctly! Thanks for the opportunity to share and to be inspired! My stash?? I have six plastic bins full of fabric, plus a bookcase full of fabric. No idea of how many yards. BUT, that doesn’t keep me out of the quilt stores buying more! thanks Amy! i posted about my latest project, finished about an hour ago..
as for my stash, I’d say I’ve probably got close to 500 yards, but who’s counting? This is a really cool idea to have an online quilt festival. I love looking at all the quilts. You said something about the yards of fabrics in our stash….I’m sure I don’t have as much as some, but KNOW I have more than others. But even if you have a LOT, you can always use more! I remember one speaker at our Guild said that it was our obligation to buy fabric as quilters. I love that, and so I try to follow it religiously every chance I get! I’ve written my post and put it up! I originally had a giveaway offering in my post but took it out as soon as I noticed your stipulation not to. Let’s see….I think I have probably about 200-300 yards of fabric in my stash! I’m not really sure, and precuts are very hard to count! I probably have about 150 yards in FQs alone! This is my first time joining, but I’ve had so much fun looking at everyone’s fantastic quilts! I made my quilt, for a special little girl who was born with Downs Syndrome. There are so many talented quilters, that lead to much inspiration, but so little time.I’ve already started dreaming of what to make next – maybe something for me to curl up with this winter. Thank you for organizing this Quilt festival again! This is so much fun. Thanks for doing this Amy. I love the creative inspiration that comes from sharing. Don’t tell my husband but I have thousands of dollars worth of fabric on hand I think. He has no idea. I have about 30 “quilts” sitting ready to make. I just can’t produce as fast as my stash acquisition. It’s so much fun, and so addictive! This is great fun! Thanks for hosting this again, Amy! I have no idea how much fabric I have because it has accumulated a little at a time over the years. I’m so excited to enter the festival for the first time! Can’t wait to check out what others have been working on! I have so many yards of fabric just waiting for me to have more time to quilt. It makes me hate my day job. :) I would say that I have at least 15 quilts and all the fabric waiting for me, most of which are queen sized quilts. YIKES. I’m excited to be a part of the festival and can’t wait to spend my evening checking out everyones site. As for how many yards I have in my stash… approx 200. yikes!!! What a wonderful idea for quilters to be inspired. Hmmm. how many yards in my stash? Quite a bit! I don’t think I want to know & I’ll never be one of those bloggers that says how many yards in/out each week since my MIL reads my blog! Oh thank you so much, Amy for doing this.. I am looking forward to visiting the blogs and get inspired to make more projects. I have posted my favourite quilt project and must admit I would not be able to give you a true figure as to how much fabric I have in my stash. I like to work with pre-cuts so I have a lot of layer cakes, jelly rolls and charm packs. Along with that I have the yardage to match which here in Canada is measured by the meter rather than the yard. Ok .. I’m ready for some serious sight seeing! Hi Amy! Thanks for yet another round of this fabulous event, and I’m so excited to be participating this time! As you know I’m a knitter and crocheter and I have no quilt to share. But I feel so inspired to go cut something up. I plead the 5th on declaring how much is in my stash! : ) I am guessing well over 100 yards but I am actually afraid to count it! Thanks or hosting again Amy! I am looking forward to browsing through all the quilts in the coming days! I love the linky pictures too! I don’t know how much fabric I have. I know I have enough to fill 4 (58 qt) tubs! Some of it goes back 10 years! I love the quilt show. Wow! Look at all those amazing quilts! I could just stare at them for hours, so beautiful. LOVE the new photo links, changes everything–nice work! Can’t wait to sit and read about all of the lovely projects:) Thanks for hosting!! Sorry for double commenting–forgot to enter my info..oops! Wow what great sponsors you have! I’m a little embarrassed to tell you about my stash–I’m guessing I have around 500 yards. Thanks for hosting again! Just found your blog and have entered the first quilt I made (just this year). I honestly couldn’t say how much fabric I have. I have a few yards of heavy duty cotton and the rest is scrap pieces and several items of old clothing which I intend to repurpose. I have a lap quilt in progress now which is being repurposed from a rather brightly coloured skirt of my daughters. Oh boy! I really cant wait to start clicking on all the links and seeing all the quilty goodness that’s out there. Wow Amy! Another successful Bloggers Quilt Festival! Hmm, not so sure I can calculate the yardage in my stash, can we just accept ‘excessive’ as a quantity. Outgrown it’s storage (room) and overflowing would be a good description at least! LOL I’m sure I’m not alone! OMG! I figured it out! Very new to all of this, but so happy to be playing along. Thank you Amy for organizing. I’m sure it it a ton of work. Oh . . . you wanted a fun fact didn’t you. Well, I have been quilting on and off since I was 14. Don’t ask. I think I have about 200 yards of fabric, that’s not alot right???? And I believe I have made over 100 quilts so far. I mostly give them to friends. wOw! I can’t believe all the beautiful quilts that have already been entered! This is going to be a great show :) Bravo, Amy! I have added my quilt to linky and blogged about the festival here (http://lazylabquiltcompany.blogspot.com/)! Thank you for the opportunity! I’m afraid to look at my scraps to see how much I have! I guess in the neighborhood of 6-7 yards??? Thanks Amy for all your hard work!! It’s great to have all these lovely quilts gathered on ‘one stop shopping’..lol….I have posted my entry this afternoon and as for how much yardage I think I might have….?? ?…LOL….I have always thought of it in dollar signs rather than how much yardage….but I will give a guess of AT LEAST 500 YARDS…eeeeee gads…did I really say that out loud!!!! Thanks for doing this Amy. I love the virtual shows, you get to see so many different styles, the inspiration is amazing. Count me in again! What a wonderful time of year!! Thanks Amy for all your hard work!! It’s great to have all these lovely quilts all in one place to see and be inspired by …I have no idea how much fabric is in my stash…I’m too scared to count it all up…I’ll just say “LOTS” it overwhelms me at times! This is my first entry to the Blogger’s Quilt Festival. Thank you for doing this. I guess I probably have about 100 yards of fabric – a lot of it that I dyed myself. Thanks for hosting again Amy – so much fun! As for how many yards in my stash? Too many to count! But that’s a good thing, right??? I live in Sri Lanka and just looking at the links is gorgeous enough. What a lot of talented people. Beautiful stuff here. I am linky’d in to the festival and am enjoying the show myself. Thanks for hosting this great event. Judy D. in AZ http://jdqltr.blogspot.com. I’m having so much fun looking at all the quilts. It’s almost enough to make me want to start a blog. I plan to look at every entry-hope I make it! Thanks for doing this each market. I just finished blogging and linking. I always end up with so many more blogs on my reader after this festival, it’s great. Thank you. 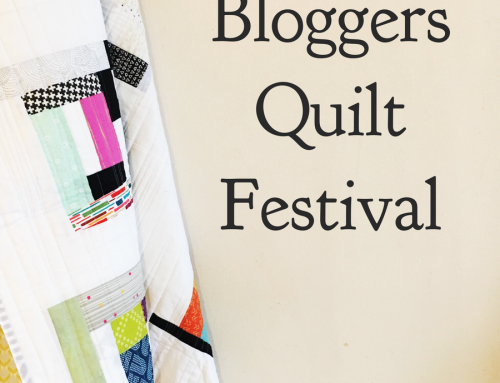 I am very excited to be part of your Blogger Quilt Festival. This is my second time to participate. Regarding the yardage in my stash — I can only say it is a lot — no clue — and no way to figure out how to start counting. I do keep track of how much I buy and how much I use every year, with a goal of using at least 100 yards more than I buy every year. wow!!!! What a fabulous show of quilts!!! I added one to the flicker group. I don’t have a blog so wasnt sure how to do it here. This is awesome!! the quilt I blogged for the festival was my 12th quilt. I started it exactly 12 months after I started quilting, and it comprised fabrics that I had used in the previous 11 quilts. The thumbnails are awesome! It’s like a mini-quilt show right on your blog. How much fabric do I have? No clue! I’m afraid to count just how many yard of fabric I have in my sewing room; but it’s a lot! The photo listing of the quilt entries is wonderful; it’s nice to be able to see a little before actually beginning your tour. this is such a great idea, and likely a whole lot of work to pull it together! Thanks for the opportunity! My stash – small. It needs to grow. I need to go to all these great fabric stores and designers on line and build me a good, modern fabric stash. Goodbye calico and traditional patterns! Hello modern colours and gorgeous prints! I’m looking forward to going through all the quilts. What a fabulous festival. I will spend hours surfing through the quilts, and then through blogs finding inspiration and links to new and interesting people and sites. Thanks so much for hosting this – a great idea. The best quilt show I’ve been to this year!! This is my first entry for Blogger’s Quilt Festival. I am so excited to be able to meet so many quilters in one place. I am going to be busy visiting all these blogs. I added my link and I look forward to meeting alot of new friends. This is so fun! I’ve never entered a contest like this before. I began my quilt in the mid-90’s and finished it this past Monday. : D So I’m slow. And it’s definitely a learning quilt, but I love it anyway. This is awesome! I’m going to set aside some time this weekend to browse all the other contributions. So far, they look beautiful!!! Thanks again Amy for organizing this event…i just brewed some tea, and plan to spent the next hour(s) looking through some quilts! as for yardage in my stash? i would be scared to know that answer! NOT even going there! I love seeing all of the beautiful quilts! I have only been quilting a few years, but I guess I have about 100 yards of fabric. I also cross stitch and needlepoint, so I have to spread out my crafting stash money!!! Thanks for the great giveaways!! Thanks for hosting and for allowing relatively new quilters/bloggers to share work. I really appreciate it. Happy to be participating here for the first time! Yards of fabric in my stash? Hmmm… a rough guess is about 25-30? I’ve only been quilting since July though! I can’t wait to see everyones quilts! Thank you for all the hard work you put into this Amy! I can wait to view all of the quilts! Thank you Amy for all of the hard work you put in to this round! This may be a duplicate…apologies if it is! This is my first time participating in a blog event – what fun! It’s great to look at all the fabulous entries! Thanks, Amy, for all the work that you have put into this! My stash is no where near large enough. Guess I need to go on a fabric binge. Darn. Thanks for this opportunity. I have never shared in an online quilt show before but have enjoyed seeing what others are doing. If fact that was why I joined the blogging quilt community. Sometimes it is sensory overload but I love it. Well I’ve done it Amy – I’ve posted in the Blogger’s Quilt Festival! I hope, hope, hope I’ve done it all right. The most challenging thing for me about blogging is figuring out how to use the computer…. I haven’t got the faintest idea how many yards of fabric are in my stash. I feel challenged by your question to spend a bit of time trying to figure that out. I have fabric all over the place. Thanks for hosting this festival. I am determined to look at as many posts as I can and to comment on them all. Great prizes too. I don’t even want to guess about how many yards in my stash-OMG is all I can say. I really do need to get busy and finish all of my quilt tops. What can I say, I love to be inspired….but I need to finish things through to the end!! Thanks to all of your sponsors as well and for the opportunity to win some great gifts!! Thanks so much for the fun Amy! I have no idea how many yards of fabric I have stashed~ and ya know, I don’t think I want to know! LOL Happy weekend! There are so many quilts linked in now that my page won’t display them! Instead, I’ve been looking at the quilts and stories posted on the various linked in blogs. Thanks again for having us all for the Festival! So nice to see all these other quilts and to be part of this HUGE event! So much fun! WOWZA! Quilts Quilts and Quilts! I think I’m even going to be brave enough to link in my first ever non-baby quilt! So great! As a new quilter… my stash keeps growing. I for sure have “eyes bigger than my stomach” but I feel like it’s leveling out, I look at the fabric and feel like the projects are just ready to leap out of the piles. I’ve slowed down buying and started more sewing! Thanks for hosting this awesome event. Your online quilt show just gets bigger and bigger every time you put it on! Thanks again for organizing the show. I washed all of the fabric in my stash this summer and estimate that I have about 100+ yards of fabric in my quilting stash. I have been using up a lot this year as I have had some extra sewing time lately and I have not been buying much fabric lately. Amy, Thanks for the opportunity to share my new-found love of quilting! I don’t have much of a stash yet, but I did buy a whole bunch of David Walker’s robot collection before I had a project in mind… Thanks again for providing this venue for us! I am so glad you do this!! I was almost not going to post something, but decided at the last minute why not! I have really enjoyed looking at everyone’s projects and seeing more than just the quilt!! Amy, thank you for continuting to put the blogger’s quilt festival together! My stash is getting very scary, I need to used what I have instead of buying more and more. If I had to guess I have about 20 yards, but it may be more. LOve the new linky thing where you can thumbnail the quilts! Very nice! Thanks for hosting the awesome festival. Ummm stash yardage? Maybe 20 yards? Not much of of a fabric hoarder…keeps me up on my projects and forces me to actually use what I have. Thanks!! I can’t wait to make my way through all the links! Thanks, Amy! Oh my goodness, what deep dark secrets can I reveal – well, I know that I have more fabric in my stash than I will ever use in my life time. Some of it I bought years ago and my liking for it is so strong that I just can’t cut into it, instead it hides away in a cupboard protected by other pieces. There is no way I could even guess at how much fabric I have in total and to even try to count it would be worse than standing up and say ” Hi my name is Miche’le and I am a fabricoholic”. thank you for the oppportunity of entering my little quilt in your festival. Hi Amy, Thanks for the opportunity to show my quilt. My stash… well lets just say if I laid it out I think I could be at your door. (I live in Melbourne Australia) Ssssh. It’s so hard to say how many hundreds I may have of fabric in my stash. It’s hard to go to the store and just look. It doesn’t happen. I’m really liking right now the panels of vintage looking children. I’m not sure how to use them though. 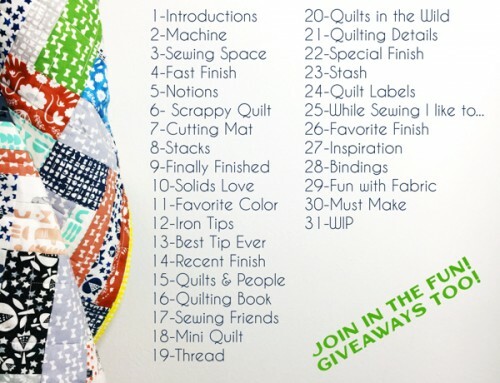 this is wonderful, great prizes, and awesome to see so many inspiring quilts! thanks. as for yards- i wish it was more, but probably only about 10 : ( at the most- hoping to increase my sad stash with these great giveaways!! Hi Amy!! Thanks for hosting another awesome festival! I love the linky with the photos of the quilts!! As far as how many yards of stash….I really don’t have much of a stash. When I buy fabrics, it’s usually with a quilt in mind. I don’t buy too much “just because”. I do have some precuts though, and those are nearly 3 yards each…so I’d have to guess…maybe…20 yards?! Rough guess….LOL! Now I must hide in my sewing area and sew away. Thinking about all that fabric makes me want to sew sew sew! Wow! What a great bunch of quilts in here already! I am so happy to be in here with everyone else, and am looking forward to a lot of browsing this coming week! Thank you Amy! Amy, wonderful job again as usual :) The prizes sound terrific and all the thumbnails of quilts very enticing. Of course I have entered again. Umm, stash yardage is probably about 60-70 yards, I’d say? It’s hard to count up all those fat quarters, LOL! How many yards in my stash?!! That’s as embarassing as asking my weight!!! Both are over 100 – LOL!!! BEAUTIFUL quilts – GREAT giveaways – THANKS! This is my third time being a part of your Bloggers Quilt Festival. Thanks so much for all of your time and effort in making this possible so that we can have this amazing virtual quilt show. how many yards do i have in my stash??? I have no clue! Maybe 100 give or take. It’d be interesting to know. Maybe when I clean out my built-in, I’ll figure it out. Now I’m curious! Thanks for organizing this! It’s always fun to see all the beautiful work out there! This is my first time in the festival! This is fun! I will keep checking back all week. I would guess my stash is probably between 75-100 yards. Yikes! Time to get quilting! I finally got some time to link up,thanks for doing this..I always discover some cool new blogs to read! Thanks for doing this, I always find some new to me, hip fun blogs to read! Yay! This is my first time participating in the festival. Thank you! I shared a quilt I made for cousin to take with her to college. Hi Amy…..thanks for doing this and I missed out last year but have entered this year. Wow….some awesome quilts have been entered. I have no idea how many yards I have in my stash….I reckon it would be way over 1,000 and growing…in fact I bought 5 more yards today. I love fabric and I love seeing it done up into the quilts too. Thanks again. wow, that is a lot of photos! I am hoping for a nice weather day tomorrow so , I can get a better photo! i found out today in designing my post that my photos is blurry! Amy, thanks again for hosting this wonderful quilt festival. I’ve already found tons of inspiration looking through the quilts posted by other bloggers. My creative wish-to-do list is growing. An amazing amount of talent out there! Great to see all the quilts and their stories that are up already. How many yards of fabric in my stash … maybe 50! Amy, I have to tell you the timing couldn’t be better — this is a welcome respite from the endless campaign sniping and bickering that we are bombarded with on TV leading up to this election on Tuesday. So much more fun to look at quilt blogs and turn on the stereo. It made for a relaxing Friday evening. Thanks. Amy a wonderful idea and an amazing way to share with quilters worlg wide. I love everyone’s stories. The thumbnails are great!! Will help me keep track of who I’ve visited. Amy thanks for implementing your wonderful idea. You have enabled quilters world wide to share. Something we like to do. The thumbnails are great for visual learners like me LOL I might not loose my place. Amy thanks for implementing your wonderful idea. A great way to enable quilters world wide to share. Thanks for hosting Amy. This is such a great idea. I cant wait to get round as see everyone’s creative masterpieces! hello Amy~ I am back again, thanks for hosting this again. as for how many yards of fabric are in my stash, not a whole heck of a lot. I would say about 10 yards (probably less) I can only afford to buy as needed and not any extra. Thanks!!! Thanks for hosting this Amy , i love to see everyones quilts and draw inspiration! So excited for BQF to be back again! I just love all of the creativity and buzz over quilts! I cannot even begin to fathom how many yards of fabric I have in my stash…over 100 for sure. YIKES! Thanks for hosting us all again. just want to say that this year’s festival is spectacular! Having thumbnails of each entry is perfect! Thanks for the fabulous festival. The answer to the question if you ask my husband – too much fabric, if you ask me – not enough fabric! I have WAY too many yards to count. I can tell you that I have a full kitchen sized trash bag (like 13 gallons or something) of scraps from just the last month. I’ve been sewing a lot of things for Fabri-Quilt’s Quilt Market booths, so I have a ton of fabric left over from that stuff. That doesn’t even count all the fabric that I’ve purchased. I have many boxes (that I haven’t unpacked from our recent move) to re-wash, iron, and put on my new mini-bolts. Ah! So much to do! I’ve made a lot of things for Fabri-Quilt’s Quilt Market booths over the last month or so, so I’ve been sewing a ton lately. Just from this sewing, I’ve collected about 13 gallons of scraps. I have a kitchen sized trash bag filled with scraps and leftovers from all these projects. I also have 4 really big boxes crammed with fabric to unpack from our recent move. My plan is to re-wash them, iron them, fold them, and wrap them around my mini fabric bolts. I’m making myself a mini quilt shop in my basement. I’m so excited! What a fun quilt festival!! I can’t even begin to guess how many yards of fabric I have in my stash. Too many, that’s for sure. Thank you to Amy for organizing such a great event. I’m looking forward to visiting lots of great blogs over the next few days. Wow, what a great quilt festival!! Thanks to Amy for organizing such an awesome event! I can’t even begin to guess how many yards of fabric I have in my stash, too many, that’s for sure. I’m looking forward to checking out all these great blogs! I hope I can figure out Mr. Linky – having a bit of trouble. What an inspiring group of quilts – I love the thumbnail phtos! Thanks Amy to organising the Festival!I love it every season! How many yards in my stash?…too many! I have been sewing for almost two years and have created nine quilts! I have clicked this into My Favorites. Did just a fast scroll through them. Have to go out of town to a quilt shop and get some more fabric for a workshop Monday night. When back will sit down and look at all the gorgeous quilts one by one. This is the kind of candy I like the best all year around. I am so happy the quilt festival is here!! I just started quilting about a year ago, so I don’t have that big of a stash yet. But I have learned to be a scrap hoarder. I am hoping to start my first scrap quilt maybe after all of my WIPS and Christmas gifts. Thanks for putting this on Amy! Thank you Amy for hosting this awesome festival!! Love this whole idea Amy!!! Thanks for putting it together and letting us all be a part of it. As for how many yards I have in my stash well that would cause me to go into lala land if I even knew that number. However, I do know the number of yards that I have of my favorite fabric line ‘Make Life’ and that is around 70 yards which is made up of yardage and precuts. I know, I know nuts right. We I do have projects planned for it! Ok Amy, I am in day 2 of this and so far, I haven’t done much sewing. I can’t seem to get myself away from the computer, with so much eye candy to look at. Guess there is a down side to this after all!!! :-) Thanks for opening our eyes to the big quilt world we have in cyberspace once more. hoping this isn’t a double post – it appears as though my previous comment didn’t post? Wonderful festival. Don’t have a blog yet, but I do have over 15 bins of fabric. No way to count how many yards. quilt festival time!!! fun. fun. Love the way you did the links this year, what a great idea! Thanks for all your hard work Amy. How many yards of fabric? I wouldn’t have a clue, but my best guess would be at least a couple of hundred. Yards in my stash? Have absolutely no idea, it’s not an overwhelming amount but it sure is enough for me shop from when sewing. I’ll guess that my stash is around 200 yards – it sounds like a lot, but looking at some my yardage pieces which are about 3 yards it sure adds up quickly. Thanks for organsing the Blogger’s Quilt Festival – I’m having a wonderful time looking at everyones quilts. I have so much fun visiting blogs. It is so inspirational and then I can get at using up some of my stash. There are hundreds of yards folded away in the closet. But the new fabrics keep calling me and I buy more. Sure need to do a stash bust. The thumbnails are a great idea! Love looking at all the beautiful entries! How much is in my stash? Too much to count … is there a quilter’s anonymous, similar to AA? If so, I think I need to join! Thanks for hosting Bloggers Quilt Festival! Hey Amy, Happy quilting to you. I love the festival. I am going to eat some lunch sit back and borrows the quilts. My closet is full of folded fabric, hundreds of yards, enough for a lifetime, but I love all the new fabrics so I get more. Sure need to do a stash bust. Maybe I should have a quilting party. My mom was visiting and we went into the closet and picked out fabric and made a quilt. No need to go to a fabric store. I should invite people to a come raid my closet and they could make a quilt. It is so inspiring to visit the blogs. Hi, Amy! Wow! This is huge! So many beautiful quilts from all over the world! I look forward to watch them all. I am no longer jealous at all the quilters visiting Houston these days. Thank you for doing this! This is my entry for Amy’s Creative Side “Bloggers’ Quilt Festival. All the entries are Awesome! Very creative people out there! Thank you so much for putting this on again! How many yards in my stash? My best guess would be over 150… but don’t tell my husband LOL! That’s a hard question – I have no idea how many yards of fabric I actually have. It keeps growing these days! I would estimate about 50? I tend to buy in 1/2 yard increments (unless I find a good sale), so judging by how many fabrics I have, I think that may be close. But, even with all that fabric, I always seem to need to run out and buy some additional fabrics for different projects. How can that be??? Thanks for organizing and hosting the festival!!! I have so much fabric I don’t know if I could even put a number on it! If I had to guess, I’d probably say something around 300 yards?! ….yeah….I didn’t fully realize how sick I was with “fabric fever” until just now!!! What wonderful quilts! I love sharing mine, and I can’t wait to check out all the others! Yards of fabric in my stash? No clue. I don’t have a huge stash compared to some… maybe 30 yards? Amy I just love this Quilt Festival. I really love the new linky with the pictures, that is truly awesome! I am not sure I would want to know how much fabric I have in my stash, I already feel guilty when I buy more. :o Lets just say I have plenty. LOL Thanks again for a wonderful Quilt Festival. It’s such a pleasure to enter. Thanks for creating this lovely tradition! Amy, Thanks for hosting this wonderful quilt festival. It has been so much fun seeing all the quilts and the wonderful stories. I can’t even venture to guess how much stash I have. How about I just confess that I have just over 10 yards that is flying it’s way to me to join the stash family. Amy – Thanks for hosting the Blogger’s Quilt Festival. It has been so much fun visiting all the blogs and reading the quilt stories. I can’t even begin to guess how much stash I have. I will confess that there are 10 more yards winging their way home to join all the rest of the stash family. You have created another lovely festival. I particularly like the thumbnail photos of the quilts – It is a beautiful sea of color. I hope to get to visit the many quilts but it is going to take me awhile to get through them. I have so much fabric I am too scared to count yardage- I have around 25 boxes full of fabrics- it is sorted and organized enough that I can find what I am looking for usually. It would take more than one very long life time for me to use it…. I do love fabric. Thank you so much for hosting this again! I’m a first-time participant, although I’ve always loved looking at everyone else’s beautiful quilts. It’s fun to find new favorites! As far as how much fabric I have in my stash– I went and did a rough estimate just now, and I think it’s over 400yards! I had no idea. Don’t tell my husband! Amy, where is the list of quilts ? – while the pictures are cool they do not change color like the list does after I have read a quilt entry….. that is how I keep track of what is read and what is not, it takes weeks for me to go one by one through the list….. what gives? This is such a feast for the eye and the soul – I love looking at all these beautiful quilts and reading the stories behind them. It is wonderful to be a part of this great event – thanks Amy! I don’t have a blog, so I am just a very appreciative viewer. What a fabulous list of quilts and blogs. I have already found several new blogs to add to my daily blogrole. I really like the thumbnails this time vs. link list of festivals past… much easier to keep track of where I am. Day 2 of viewing and still only about 25% of the way through the list. LOVING it all. Thanks to Amy and everyone who is participating! Grazie Amy per l’opportunità di conoscere tanta amiche! When you click on my thumbnail photo as well as a few others it will not direct viewer to my blogspot. It has driven me crazy trying to figure it out but I think what has happened is the address prints http:// twice and that makes computer read it wrong and is unable to redirect to blogsite. When you click on my thumbnail it shows http://http:// grannysblooms9.blogspot.com/ and it will come up as error. I noticed maybe a dozen or so that this is happening with. What beautiful quilts and what a great idea! Thanks for your hard work! Thank you so much for hosting the quilt festival again. I really enjoy looking at everyone’s quilts and reading the stories behind them. I have a huge stash but have disguised it by cutting 3/4 of a ton of it into strips of varying sizes. Since I no longer have THAT fabric in my stash, I can now say it is a wee bit smaller. And it doesn’t help that I have a quilt shop out my back door and am a serious fabriholic! And, I own the shop, lol! Thanks again Amy, this is so much fun! I’m a little embarrassed to admit the size of my stash…it might be close to 200 yards. Yikes!! But I love every square inch of them!! Thank you for hosting the fabulous BQF! It took me a few days, but I got my link added! Wow, there are endless hours of surfing here, I am so excited. I just have to say, that I am so excited about The Sewing Summit, and the fact that after living 10 years away from home, I will be moving back just in time to attend :) I can’t wait to meet you and so many other amazing quilters!! I started doing some rough math on how many yards of fabric I might have…and then I had to stop. My husband walked in. I’m sure you all would understand! Thanks for hosting this Amy. Every year I find new inspiration and even some awesome new blog friends! Amy, you’ve stimulated so much sharing in the quiltmaking community with your inspired online Quilt Festival. Even though I’ve been quilting for more years than I can even believe, I still consider myself a relative novice. I’m so happy to be able to explore others’ creativity from the comfort of my home computer. Oh, and I probably have about 1,000 yards of fabric in my stash; I sure wish I could use it up more quickly. I sure hope I win some fabric: my stuff is sort of old and tired! Thanks for hosting this Amy, i love checking out all of the beautiful quilts and drawing inspiration from them! Wow! These quilts are all amazing – what a GREAT thing this online quilt festival is! I’m a relatively new blogger, so I made my entry despite being instantly humbled by these entries… this will be a difficult site to stay away from when I have to go back to work on Monday! I hope i’m doing this correctly. lol This is my entry for the festival. I don’t know exactly how many yards of fabric I have stacked on a shelf but it must be close to a hundred…. Thanks for the wonderful online show again Amy!! There is so much great eye-candy and fun blogs to explore; it’s going to take awhile. I don’t even want to start to guess how many yards I have in my stash!!!!! Somewhere between 100 and a million I think lol! thanks so much for hosting / organizing / coordinating Amy … it’s always fun fun fun ….. Thanks for hosting again. It’s always fun to see new quilts. I would have to say I probably have about 400 yards of fabric in my stash. Sshhhhh, don’t tell my husband. I have joined the Blobgers Quilt Festival for the first time all the way from The South Coast of Australia. I am so looking forward to looking at all these beauiful quilts. I love a good quilt story so am very much reading all of them as well. Amy…thanks for hosting the Bloggers Quilt Festival… I have visited before but this is my first time to show a quilt. It’s a feast for the eyes, a virtual rainbow of quilts! I just need a few days to check them all out…well, we all got an extra hour this weekend, so you all know what I am going to be doing with the extra time! I don’t have a huge stash but it’s been growing recently which has been such a treat and lots of fun :) I generally like to get fabric and use it straight away , time permitting of course ;) If only i could retire from the day job! lol! Thanks for hosting the festival once again, it’s so great discovering new favs as well as seeing familiar ‘faces’. I am not sure if my comment b4 made it as my putey did something really strange, but I know I didnt answer your question about how many yards of fabric I have in my stash. If you take into account all my FQ’s and F8’s I am thinking at about 100 yards (I am an Aussie so it really would be about 100 metres), not too mention all the jelly rolls, layer cakes and charm packs i have waiting to be used. hi there. i am currently working on my first quilt, so I don’t have a photo to add yet. I found Cara’s wonderful First Quilt tutorial on her Obsessively Stitching blog. It’s been great fun! Please enter me in your giveaways. Would love to win something that will inspire my second quilt! Thank you so much for hosting this virtual quilt show! Thanks also to your sponsors. I’d be thrilled to win anything, even though I already have approximately – gulp! – 1700 yards of fabric in my stash. I try not to think about it. Actually, I’m trying fairly hard not to buy anything I don’t need for a specific project. It’s a challenge because there are so many wonderful fabrics coming out every month. Amy, Thanks for hosting this festival and giving us the opportunity to share the quilt we made for our Nana. Brenna (my daughter) and I spent some quality time snuggled on the couch tonight looking at quilts. So much fun!! I can hardly believe how many entries there are already! This is my first bloggers quilt festival, and it is the coolest idea! I love seeing all the quilts, and I am so happy I am able to share one of my own. Thanks so much for hosting this! Thanks so much for organizing this huge event again! I look forward to it and love to visit the blogs and read all the quilt stories. I don’t have a huge stash yet but I bet I have 10 to 15 yards by the time you put all the fat quarters together. Thanks so much Amy for doing this!! Such lovely quilts and wonderful give aways. It was so easy to enter my quilt!! Take care! I love that you have the pictures instead of just the names and titles. It makes it easier to look at the quilts. Last time it took me a week to look at the quilts because I kept losing my place on the list. this way I will know where I left off. thanks I love this kind of stuff. Thanks for putting the pictures up. I love it. I love the quilts this is awesome. Thank you for hosting, again. I love the thumbnail/link this year. Thank you for hosting the festival again. I hope I can find time to see all the quilts, but already it’s looking like an overwhelming task! I’ve tried to link my quilt up, but am having trouble (I feel like that one annoying person because I had trouble with the one thing challenge, too), but I’ll try again tomorrow when maybe my computer will be in a better mood! As for my stash…I don’t really have any idea. Lots. Too much. But I don’t know many quilters who can’t say the same! Thank you for hosting this Amy! I am having so much fun reading about everyone’s quilts! Hmm…I would guess I have about 20-30 yards of fabrics in my stash! I can’t help it, I love fabrics! I posted a comment but not sure if it was published since I didn’t see it. This is my entry for the giveaway. Thank you for hosting all of this Amy! It’s so fun!!! I just joined the festival! Thanks for doing this Amy! I really couldn’t guess how much yardage is in my stash. Some of my fabric is from before quilting but just can’t get myself to get rid of it yet. I did get rid of just about everything that wasn’t cotton. Now I need to get rid of fabric that is outdated…maybe it could be considered vintage? I just posted my favorite quilt for the festival! Thanks for doing this Amy! I really couldn’t guess the yardage in my stash. Some of my fabric is from prequilting days that I just can’t seem to get rid of. I did however get rid of just about everything that wasn’t cotton. Now I need to destash outdated fabrics…maybe they can be considered vintage? Thank you so much for hosting! It has been so much fun reading up on other peoples stories! About my yardage…hmm, I would guess my quilting cottons to be well under 20 meters (or yards if you will…)I have a big stash of stuff that I don’t use anymore, mainly fleeces, which I will be giving away to a friend. I can’t wait to have some more space in my fabric cabinet!! Came on board kind of later in the game, but I’m having a great time visiting all the blogs. My stash has more yardage than I have time to count. That’s not to say I have a lot – just that I don’t have much time :P.
Thank you for hosting the Blogger’s Quilt Festival! Wow what a great gallery of quilts, thanks for doing this to coincide with Houston Quilt Festival for all of us who aren’t there. Thanks for organising such a wonderful festival. As for our stash, we won 100 fat quarters of Jinny Beyers beautiful fabrics as first prize for one of our group quilts. We’ve used some in our latest quilt but it hardly looks as though we’ve put a dent in the box. Been looking so forward to the festival Amy! Just love seeing all the amazing quilts, so many talented artists! Thanks for a great showing everyone! I literally stumbled into the quilting blogosphere this spring the week of the BQF. I’m so glad to be participating this go round! I don’t think I’m guessing too wildly when I say that I have about 800yds of fabric. It’s a bit insane actually. A friend of my mother’s, who I have never met, literally out of the blue gave me about 600 yards of fabric (HER ENTIRE STASH FROM QUILTING) because she was giving up quilting for knitting and wanted me to put it to good use in my charity quilting. I will be sewing forever! I’m very happy to participate in this festival I’m new at quilting and I feel very excited to share my first quilt that I finished a month ago. I didn’t know I could also enter a giveaway, so there you go, more fun! thanks a lot! I’m so happy to participate in this festival! Thanks so much for the chance to win wonderful giveaways too! Hi Amy, this is such a wonderful way of showing quilts….. and obviously enjoyed by the number of entries and comments…. what a big job you have taken on. Stash you ask????? Mmm as a new quilter I think I am overestimating when I say I have 5 yards in my stash….. I’m a bit of a quilters joke amongst my friends….. but I know it will grow…. Thanks for some really lovely fun…. Great event. I already saw so many beautiful quilts, maybe once I could make such a lovely one, now I am still a beginner!!! Love to win one of the prices. Thanks for organizing this event. II cannot find my comment???? Great event, thanks so much for organizing this. I really have no idea of my stash….. !!!!!!!!!! Thanks for hosting once again the Bloggers Quilt Festival. I’ve been looking at the quilts-they’re wonderful! and yes, I did add a quilt to the festival! WOW! All of these quilts are amazing (and beautiful)!!! It is so much fun to visit all of the blogs and get to “know” new people and their work! To answer your question re: “How many yards of fabric are in my stash?”……The answer is – I don’t want to know!! LOL. Because, if I knew – then I wouldn’t be able to “justify” buying/adding any more!! LOL. 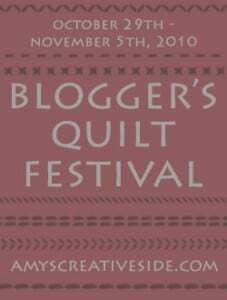 A Blogger’s Quilt Festival, what a great idea. This caused me to learn how to update my brand-new blog with a linky and grabbing a button! So I travel along with this whole new world of blogging, spending more and more time enjoying them, but still getting some quilts made because of the sheer inspiration I find. But I’m not sure I want to face the question of how much fabric I have. Too scary, even for Halloween. Thanks for the show. Wonderful! I’m all inspired now…just need more fabric of course! I’ve depleted my stash too much teaching my sweet daughter the gift of sewing! I am late entering in my comment because of the INTERNATIONAL QUILT MARKET in Houston, which has been SO MUCH FUN!!! Will post about it soon, with pictures of creators and designers of my favorite fabrics. I started this quilting blog a year ago, after seeing your quilt festival then. I was so intrigued, and worked very hard for 6 months, learning all there is to know about blogger to be ready to enter a post last spring. Thank you Amy, and all your sponsors for bringing us together. What a wonderful place to share and learn from each other. You want to know how much fabric I have in my stash??? Quite frankly, I don’t think I want to know, maybe close to 500 yards, and I’ve only been quilting 3 or 4 years! and gave away 2 big boxes last week. Definitely addicted!